Kalaripayattu, is an ancient traditional indigenous martial art that originates from Kerala in South India. The Kalari or arena is a sunken pit packed with red mud. Early scriptures state that in the 6th Century A.D, the Buddhist Monk, Bodhidharma, introduced Kalaripayattu into China which then became the base of what was later formed into Shaolin Kung-Fu, Karate and other Asian martial arts. According to Indian mythology, Parashurama, an incarnation of Lord Vishnu, established Kalaripayattu in Kerala to protect the state and provide a service to the community. This, in combination with the Kalari healing system, allowed for practitioners to develop mastery of the mind, body and healing skills, using traditional Indian medicine. With the focus on discipline, Kalaripayattu training involves warm up and flexibilty exercises, strength and stamina training, step work, traditional forms as well as unarmed and armed combat techniques. Training is always under supervision of a Guru or instructor, and only through dedication can one hope to become a Kalari master. Advanced students are guided through 'marma' vital energy point combat and sharp weapons training. This medicinal system was originally developed by kalari masters in order to heal battle related injuries, as well as to improve their students fighting abilities. Nowadays, kalarichikitsa can be applied to help a wider range of people achieve good health. Specializing in neuro-muscular (sciatica, spondylosis, etc. ), and skeletal disorders (sprains, fractures, dislocations,etc.) the treatments also help one to reach beyond one's psycho-physical limitations and are particular suitable for kalari practitioners, but also for athletes, dancers, and stage performers. 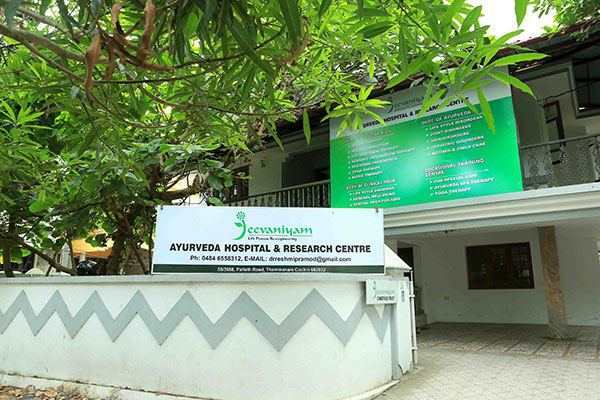 The therapy is based on the precise knowledge of the body's energetic channels (nadis) and vital spots (marmas), the wide selection of medicines, usually homemade by the Gurukkal, is entirely organic. Thailam, or oils, medicated with leaves, roots, barks, and even dairy products can be applied externally by massage, or taken internally. Numerous internal medicines are also available: churnam (powders), kashayam (decoctions), gritham (medicated ghee), etc. Uzhichil, the full body massage system executed by the practitioner with his hands and feet, is unique to kalarippayatt. It is a very powerful treatment, which requires patient and therapist to follow a strict regimen during the whole course. It can relieve serious back problems, and also increase flexibility, stimulate the flow of vital energy, and develop mental sharpness. The treatment is given by the therapist suspending his weight from ropes overhead, and applying pressure with long strokes of the soles of his feet, after the patient's body has been prepared with specially medicated oil. He also makes use of Strokes with his hands, as well as some manipulation of the joints and limbs. The training of a student to become a master includes the Training in Ayurveda and in locating the vital points of the body. A Kalari Guru is not only a trained movement artist but also a professional in Marma Chikilsa for treating general ailments and injuries happening while the training of Kalaripayattu. Kalari has developed a traditional orthopedic system which is widely popular all over the states, especially for the setting of displaced bones. Different types of Oils, pastes, herbs etc are used only by Kalari masters to treat muscle and bone injuries. The initial stage of preparation of a warrior in Kalaripayatt is based on medicated oil massage known as Uzhichal. The Ayurvedic tradition of Susrutha says that diseases are afraid of approaching a body, which has been foot-massaged, just like animals in the sight of a lion. Kalari massage is a traditional massage, using hand and feet by applying appropriate pressure on vital parts of the human body. It is a full body massage with medicated oil to stimulate the Marma points on the body. Kalari massage helps the body in attaining a healthy constitution with flexibility, nimbleness and suppleness. It also enables proper blood circulation and easy maneuverability of the body for twisting and turning. Kalari massage relieves various aches like back pain, stiffness, dislocations, and injuries and also stimulates various bodily organs and systems. Kalari - Marma Chikilsa mainly treats injuries like wound, fractures etc. Marma Chikilsa is mainly performed by a Gurukal who knows about the vital (marma) spots on human body. There are total 108 Marma points in the body in which 64 are considered as deadly points. These points could be used to heel or to harm. If these points are pierced hard, it could result in trauma or even death. Sports people, dancers, body builders, martial arts practitioners and performers who need to keep their bodies supple and in tiptop condition. Stimulate the three circulatory systems of the body covering the back and front of the body, every muscle and ligament. The lymph system is the most directly affected creating a detoxifying effect and leaving the client feeling rejuvenated. This is one of the most ancient treatment system based on the vital points of the body and it evolved along with the development of martial arts which was essential to keep the country’s freedom at that time and all the times where more injuries and casualties were happened. The masters of the Kalari (the combat training school) were good physicians too. They developed a scientific and systematic treatment stream and preserved it through their disciples. As any injury to marma is very dangerous, the Kalari Physicians transferred this knowledge very confidentially and still continues the system. Kachcha Thirummu – Massage with feet for vigor, vitality, strength and flexibility. For martial artists, sports persons, dancers, etc. Kalari treatment is a specialised Ayurvedic treatment most suited for arthritis, rheumatic diseases, backpains, spondilytis, muscular injuries, energy loss, sprains, dislocations, Joint Pains, disc prolapse correction, paralytic stroke, etc. Kalari Gurrakkal knowledgeable in human anatomy and marma, the vital parts of body effectively detects and cures such damages. Kalari treatment is done using medicated oils, pastes and tonics specially prepared in Kalari from herbs, leaves and natural oils after diagnosing the sickness and the psyche of the patient.